I'm happiest when the food I make becomes a backdrop to a lively conversation. When I'm not cooking, I'm traveling or dreaming about travel. Come sit with me, and enjoy! Read more here. It sounded exactly like the Italian red-sauce meals I ate growing up, the most famous of which was my dad's manicotti. Dad learned how to build a good red sauce for manicotti from his Italian friend's mom in high school. Dad lost contact with his friend, but he always remembered the dishes he learned and eventually adopted them as his own. 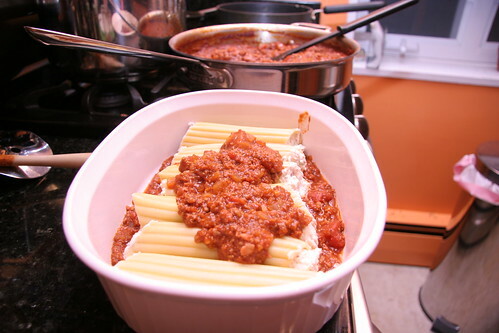 The manicotti, which he has modified over the years, is meat-packed and served casserole-style. The noodles are stuffed with a ricotta mixture of egg, parsley, onion, and ground beef and pork. 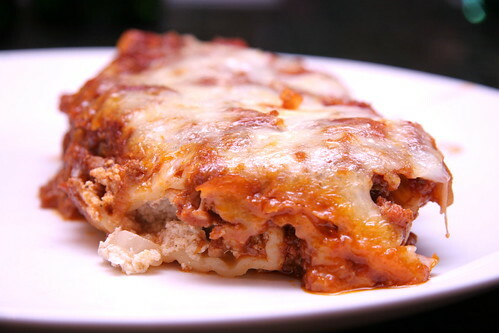 It's then baked with a meat-based red sauce and topped with loads of grated mozzarella. I loved it growing up and I still consider it a favorite. So when Jim, a.k.a. "Jimmy Meatballs," included manicotti in the menu options for Lou's birthday, I jumped at the chance to make it. That evening, we ate more than anyone thought was possible, danced crazily around the living room to Prince, and experienced a once-in-a-lifetime ode to good old-fashioned Italian red sauce. Heat the olive oil in a pan over a medium flame. Add the garlic, red pepper flakes, and fennel seeds. Simmer for about 15 seconds. Add the diced onions and anchovy and simmer until the onions are translucent. Add the tomato sauce and cook until bubbling. In a separate pan, cook Italian sausage and ground beef until cooked through. In batches, pulse the meat in a blender so that the chunks are all one size. Put half the meat in the sauce and reserve the other half for the filling. 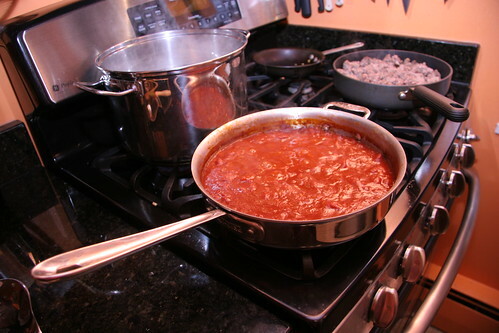 Adjust the seasonings in the red sauce to taste and cook for another hour (you may need to add water from keeping it from getting too thick). It's best if you cook the red sauce a day in advance. For the filling, heat the olive oil in a pan over medium flame. Add the onion and garlic and cook until the onion is translucent. When cooked through, set aside and cool. Add ricotta, eggs, parsley, salt, pepper, and fennel seed to a large bowl and combine. Add the cooled onion and the reserved meat mixture and combine. 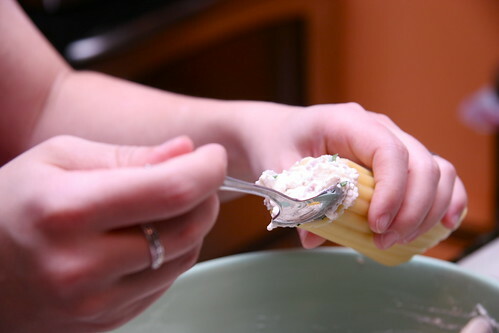 Cook the manicotti shells as instructed on the package and set aside. Preheat the oven to 350 degrees F. To build the manicotti, layer two 9x13-inch baking dishes with a thin layer of sauce. Stuff the manicotti shells and layer each shell on top of the sauce. Cover the stuffed shells with another, thicker layer of sauce, then top with mozzarella and parmesan. Bake for about 25 minutes. 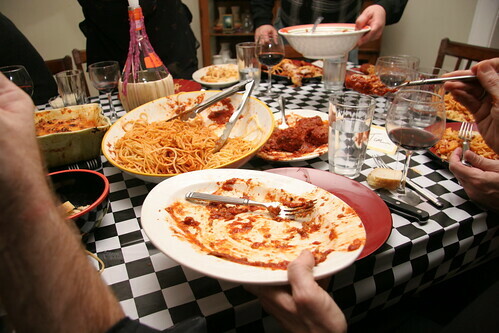 Should you ever want to throw a real red sauce-style Eyetalian feast, here was our menu that evening, which Tim Carman captured in his terrific blog posting for the City Paper. I soooo enjoyed this post, mainly because it was all so familiar from the Joisey accent to the 10 bottles of wine to the gravy stained stove!! I've lived it! Also was impressed with the recipe...not many people use fennel seeds and it adds such a wonderful flavor to food. Great job! Happy new year! OMG, your holiday table looks so scrumptious with all of those delicious meal. And, the menu so mouth watering. Seems like you have really nice gathering. I never made manicotti before, sound really delicious. Thanks, Joan! Lucky you, you got to live it! Happy new year to you! Thanks, Elra! One thing I should say about manicotti if you've never made it is that it's a lot easier than it looks. Let me know if you try it! Angela, this is surely a feast...love that about the holidays. 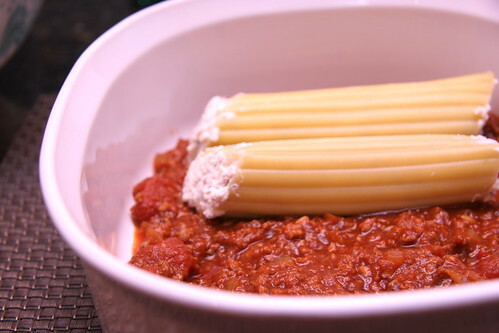 I adore manicotti and cannelloni but what is the subtle difference? Thanks, Peter! It seems the information is all over the map on the manicotti vs. cannelloni question but two themes have emerged: the size of the shell and the type of sauce. 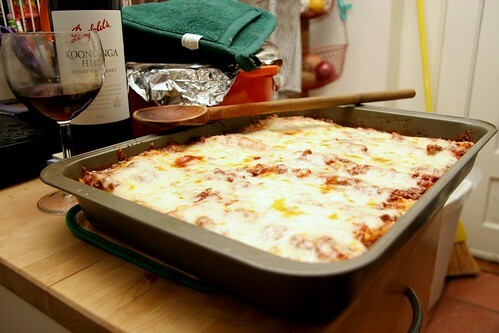 Several sites mention that cannelloni uses bechamel. I've also heard the shell is slightly smaller and it's cooked longer. I have no expertise in this though -- it would be interesting to get to the bottom of it! Thanks, Coffee and Vanilla! Seems like an appropriate dish for a cruise ship -- it can definitely feed the masses! This whole post just made me smile! Jimmy 'Meatballs" - LOL. I can't wait to try the red sauce. We have an Eyetalian friend who won't share his family sauce, the stinker. Thanks, Susan! Let me know what you think if you try the red sauce. The trick to taking it from good to great is letting it sit over night in the fridge and then re-heating it. Then it's perfecto. Im supposed to make manicotti for my husband's family "Italian Feast" this sunday (15 Italian kids in his family!!) and I'm scared! This looks like a good start, though. WIsh me luck! Thanks for you comment! I'll post it shortly. Happy cooking!